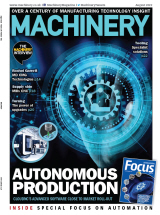 Machinery’s fortnightly editorial, news-focussed, email newsletter sent to registered readers. All of the following instructions MUST be followed when submitting ads electronically. All digital artwork must be presented in a manner ready for press. MA Business does not accept responsibility for files that have not been presented correctly, the sole responsibility for file content is down to the file originator. Copy date is 10 days prior to publication date. Drop dead latest deadline for urgent circumstances is Tuesday prior to publication - to be used only with agreement from Heather Upton. If you have a complicated message that cannot be put across within a branding or product format, then perhaps advertorial pages are a better option. No resources to write it? No problem! For an additional £500 we can provide one of our in-house team to write the piece for you to your specifications.